For many teenagers, the motto is us against the world, often believing that they are invincible and nothing can harm or stop them. Unfortunately, as reported by the Centers for Disease Control (CDC), that is not the case. The CDC reports that the number one killer of teens(http://www.edwardslawok.com/teen-driver-safe-driving.html) is car crashes. Texting and driving plays a large role in that statistic. In 2011, about one in five auto accidents in which someone was injured involved a distracted driver. Those shocking numbers inspired two Tulsa business owners to create a texting and driving simulator truck that travels throughout the area providing community members the opportunity to experience first-hand the devastating effects that texting and driving can have. The simulator is equipped with 12 simulator seats where participants sync their cellphone to the system and then begin driving in a video-game-like scenario on a screen in front of them. Experts suggest that it takes about five seconds for a driver to take their eyes away from the road to look at a text message. If you are traveling 55 miles per hour, that is the equivalent of travelling the length of a football field while blindfolded. In the time it takes to check their cellphone while driving, the drivers could end up in an accident. Luckily, in the simulator truck, none of the accidents are real. The creation of the simulator comes just a few months after Oklahoma lawmakers passed a law banning texting and driving, which goes into effect on Nov. 1. The creators of the simulator hope to show divers, especially teens, the effects of texting while driving in order to change their habits now, before the law goes into effect. 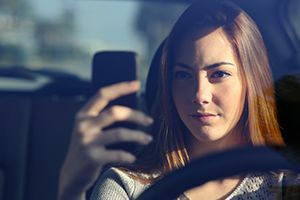 The auto accident lawyers at The Edwards Law Firm have seen the devastation that often comes with a texting and driving accident. If you have suffered because of the negligence of a distracted driver, do not hesitate to contact us for a free consultation.